Our hotel had an impressive complimentary breakfast spread complete with eggs, bacon, pastries, and nutella, so we filled ourselves up before checking out and going to the train station. 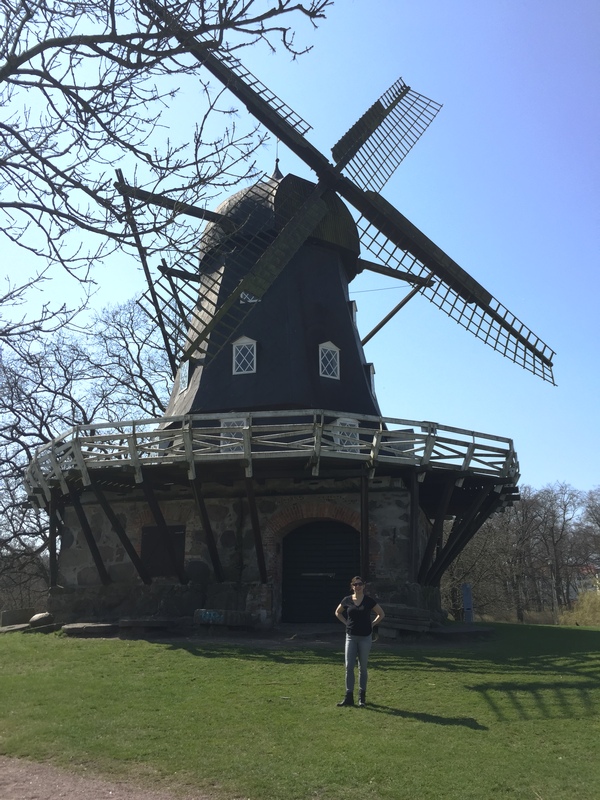 After one night in Helsingborg, we were headed for Malmö, Sweden’s third largest city. I picked up a drink called Oatly at a 7-11, which had the slogan “Powered by Swedish oats.” Another fun fact we discovered at the train station: Burger King in Sweden features a burger called Angry Bacon King. 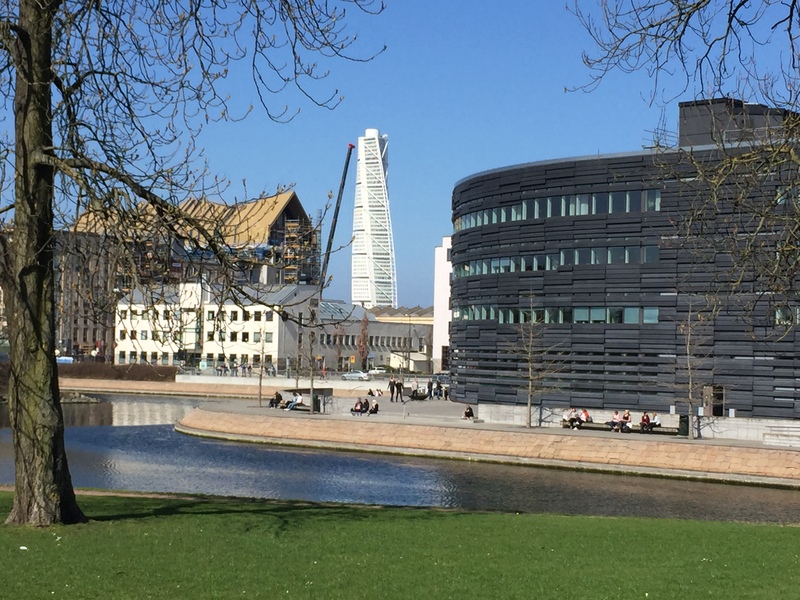 After a 50-minute train ride, we arrived in downtown Malmö.The skyline features the instantly recognizable Turning Torso, the tallest skyscraper in Scandinavia. Each floor is turned 1.6 degrees more than the previous one, resulting in a top floor that’s a full 90 degrees clockwise from the first level. The center of Malmö features a large park, Slottsträdgården (Castle Garden). Within the park, there’s the remains of a castle, a windmill, and a museum. 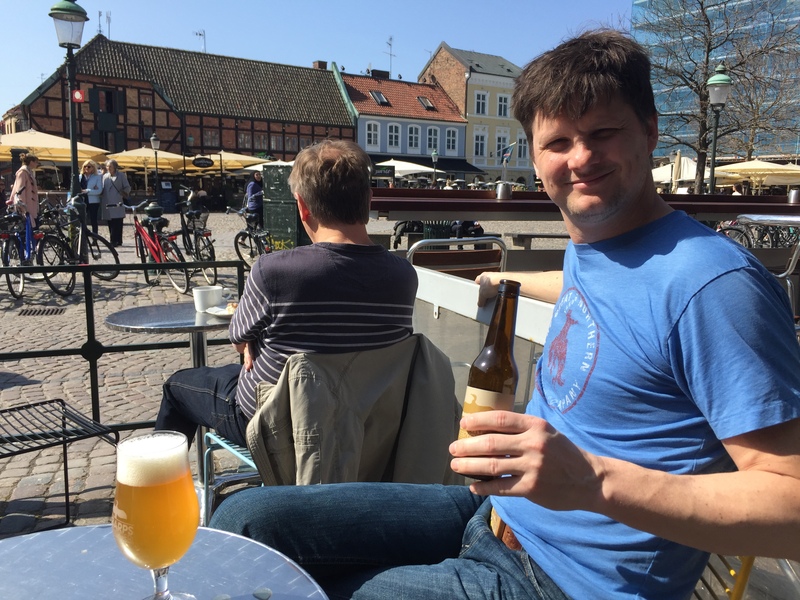 It was a perfect, sunny, 70-degree day and I was happy to have my sunglasses (though we neglected to bring sunscreen to Sweden). After we explored everything inside of Castle Garden, we walked to the main downtown drag of stores, restaurants, and beers for an afternoon beverage. A cafe called Folk a Rock immediately caught our eye with its CD album cover art decor, so we bought a round of beers and sat in the sun. At this point in the trip, I’d noticed that whenever we heard music playing in a bar, store, or restaurant, it was an American pop tune from the late nineties/early aughts. It was like Scandinavia bought every volume of the Dawson’s Creek soundtrack, put them on shuffle, and called it a day. But the Danish and Swedish definitely beat us Americans on the fashion front. As we watched people stroll by, I noticed a trio of men in their late twenties wearing tailored pants, crisp shirts, suede jackets, and stylish leather boots. Back home, their equivalents would be decked out in Star Wars t-shirts, flannels, and beards. This isn’t a read (I have a few Star Wars and Marvel t-shirts in my closet as I speak plus I live in yoga pants) but it is nice to see people put effort and care into their attire. 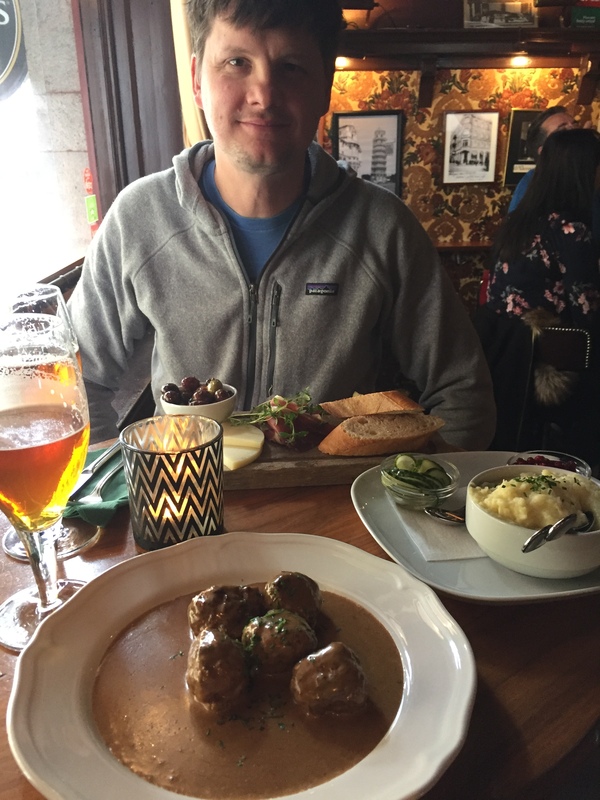 We wanted Swedish meatballs because #tourists, so Kurt googled a list of the best places to go and one article actually said IKEA (apparently they make them fresh at the Swedish locations, unlike our frozen mystery meat in the States). It reminded me of a friend who once said “If you want a good Chicago hot dog, honestly, just go to Home Depot.” We ended up finding a more traditional spot, a pub called Bullen, and the meatballs with lingonberries did not disappoint. Before heading to our Airbnb, I wanted to do a bit of shopping. We visited a few stores and both ended up buying sneakers. I had chosen poorly when it came to the one pair shoes I brought to Sweden; cobblestones will really kill your stabilizer muscles. I changed out of my flat boots into New Balances at a coffee shop because my ankles were dying. We found a sci fi/fantasy bookstore and I geeked out over all of the amazing European cover art different from the American editions. I purchased a copy of Harry Potter & The Philosopher’s Stone with a Ravenclaw-specific cover. I don’t think I’ve mentioned it on this blog yet but despite my dusky appearance, I am of Swedish descent. My great-great grandma immigrated to the States at the age of 15. She spoke no English and arrived with a note pinned to the inside of her coat with her aunt’s address in Chicago, and another on the outside that said “Mind your own business.” I like this story and think it is pretty awesome and brave, and am using this as weak justification for spending the equivalent of $50 USD on a blue winter hat that I really didn’t need that has a Swedish flag and an arctic fox on it. Our Airbnb was a few miles outside of the city center in a residential neighborhood. For dinner, we went to a neighborhood sports pub where the bartender asked Kurt if he was Scottish or Swedish (we assumed this had to do with the football game that was about to start). While eating my shrimp sandwich, I finally heard a Robyn song (it was a cover but I’ll still consider it local music). As the night grew late, we sprawled out in our Airbnb living room, resting our tired legs and splitting a bottle of wine to unwind.